Every church has a history. And every church has its secrets. And every church leader doesn’t want those secrets to become public. Most church leaders have decisions they wish they could do over. Or they wish they could talk about them and not hide them in a closet. Or both. Let’s face it. We all have secrets and we all have stories that we wish we didn’t have. But there is a fine line between “confidential” and “secret.” One of my kids has a disease that is fairly uncommon for a child her age in the United States. You cannot see it nor catch it so she poses no risk to anyone. Yet, we don’t shout from the rooftops about it, but we also don’t hide it. It is not really a secret, it’s just confidential. If the matter does come up, my wife and I are not afraid to discuss it or even divulge lots of educational information about it. The details around my daughter are confidential and we choose when and where we discuss the matter and to what extent. But it’s really not a secret, we are not “hiding” anything and if in some bizarre twist of fate, my daughter ended up in the news, we have nothing to hide. Can you say the same thing about the decisions you make for your church? When pressed with making difficult decisions, whether alone or with a staff or board, will you have something to “hide?” When all is said and done, will your decision, if found out by the public, be one you would be embarrassed about? Let’s put it another way: What if your decision, the one made in secret, ended up on the local nightly news? What if the daily newspaper printed it for all the city (or region, or nation!) to see? How would you feel? Would you be embarrassed? Would you be proud? Would the decision speak for itself and leave you with no reason to respond? 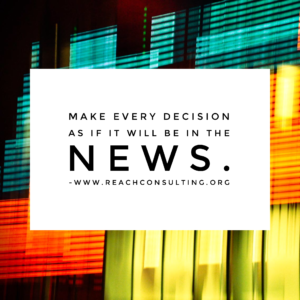 At Reach Consulting, we have this value: To make every decision as if it will be in the news. We also encourage every church to embrace this value. 1 Corinthians 10:31 says, “So…whatever you do, do it for the glory of God.” Whatever you do! That includes making difficult decisions. God is watching and so are those outside the church. “IF,” and often times “WHEN” people find out about your secret, it just might make them never return and question the integrity of the church leaders. However, we also recognize there is often a need for confidentiality. I’m not suggesting the leaders of your church share everything to everyone. There are always matters of counseling, staffing, HR, legal and personal matters, and other issues that are not for public consumption and the leaders of the church need to work hard at protecting the privacy of those it represents. But “what if” those confidential decisions and discussions did happen to become public knowledge? What then? On several occasions, we at Reach Consulting have heard numerous stories from church leaders about decisions they have made and worked hard to keep secret. On every occasion, when asked what would happen if the news got out about the details of their decision and the circumstances that surrounded it, and if their congregation found out about the truth, we get the same response. Silence, with eyes darting around the room hoping that someone else in the group would answer first. If you cannot answer this questions, then this is a sign of a decision that might end up in major embarrassment. 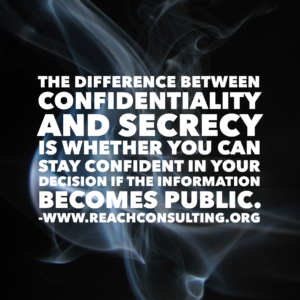 The difference between confidentiality and secrecy is whether you can stay confident in your decision if the information becomes public. You often cannot fix the past, but you can change how you respond in the future. Work with your team, your staff, your board and with yourself to make better decisions you won’t be embarrassed to hear about on the news on Thursday night. Or in the pew on Sunday morning. Make every decision as if it will be on the news. Does your church leadership have decisions it would regret if they were made public?